Often times, kids are not allowed to go out in the snow and play, lest they catch a cold. Beat common cold with this fun indoor winter activity. 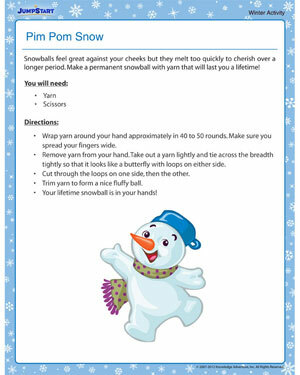 All kids need to complete the winter activity is a yarn of white wool and their dept fingers! After the white pom pom is made, you can also tie a string to it and hang it from their wardrobe handles.